Baldev Ram Mirdha (बलदेवराम मिर्धा) (17 January 1889-2 August 1953) was a great social reformer of Marwar region in Rajasthan. He was born in Rad gotra Jat Hindu family of village Kuchera in Nagaur district in Rajasthan in 1889. His father’s name was Manga Ram. His family was given the work of Department of Post and Telegraph. “Mirdha” was the title awarded to his family for this work by then ruler of Jodhpur. He was founder of ‘Marwar Kisan Sabha’ and ‘Rajasthan Kisan Sabha’. 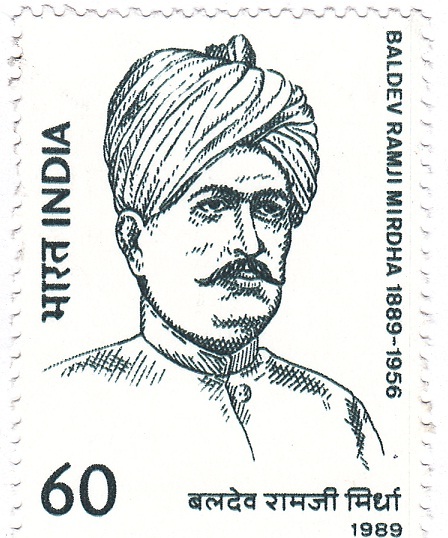 Baldev Ram Mirdha is popularly known as Kisan-Kesari. Baldev Ramji Mirdha was a great social worker and made it the foundation of his political work. He started a movement for helping the backward classes and enabling them to take water from the village well. He started a movement for abolition of customs like feasts after death. These activities enraged the entrenched leaders of society who carried on a tirade against him. He believed that education was necessary for liberating an individual and started a number of schools and hostels in rural areas. Students from these institutions are in the forefront of political and social life of the State. His various activities for organising the Kisans fighting of their right to be masters of the land that they cultivated earned him the title of "kisan Kesari". He died on 2nd August 1953 in harness while going to address a Kisan Conference.